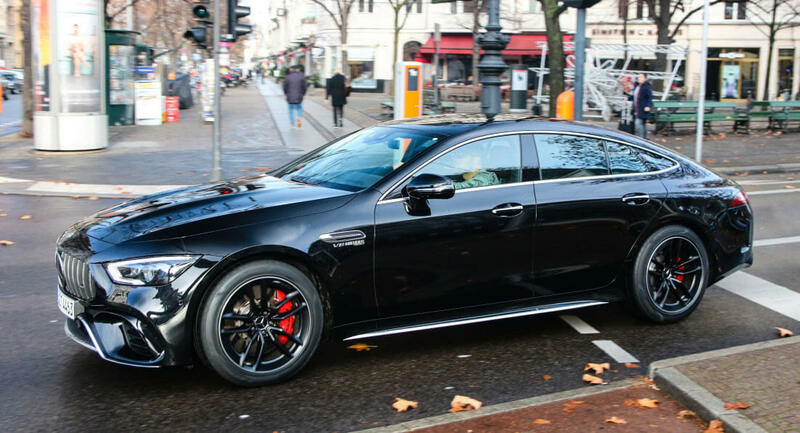 If you ignore prototype testing and any other type of Mercedes-commissioned test run involving the 4-door Mercedes-AMG GT 63, this here might just be the very first privately owned example spotted in traffic while surrounded by other cars. Why is this significant? Because it adds perspective for people who haven’t had the chance to see one in real life. Real traffic shots can be very revealing, helping us gauge how well the vehicle fits in visually with other, mostly regular automobiles. It’s safe to say that the AMG GT 4-door has zero trouble standing out in a crowd of taxis, hatchbacks, small MPVs and other vehicles that most people can actually afford. This particular one was spotted recently by Damors in Berlin, and we’ll let you draw your own conclusions as to how much road presence it has and how much attention it commands. As for which version this is, the missing “S” symbol points to this being the regular 63 4MATIC model, which is powered by a 4.0-liter biturbo V8 engine, producing 585 PS (576 HP) and 590 lb-ft (800 Nm) of torque. Performance-wise, it can get from zero to 62 mph (100 km/h) in just 3.4 seconds, before maxing out at 192 mph (310 km/h). Whether this one is also equipped with active engine mounts is unknown, since they’re an optional extra. What it does have is AMG Cylinder Management, which deactivates a bank of cylinders under partial-load, as well as when the driver opts to select Comfort mode. Next Next post: Poll: Will 2019 Blazer Production In Mexico Prevent You From Buying One?